Our Hamilton club has successfully formed seven other clubs. They include St Catharines, Cambridge, Oakville, Burlington, Woodstock, Stratford, and most recently, a second Hamilton club. Hamilton 2 became the first “two” club on the North American continent, and our Club became the Zonta Club of Hamilton 1. One of our current members, Dr Joan Heels, was instrumental in the formation and chartering of the Zonta Club of Freeport/Lucaya in the Bahamas. 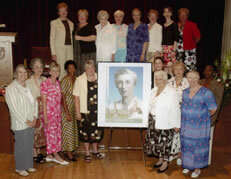 At the time, she was a member of the Zonta Club of Montreal. We have traditions in our club for providing service to our community. We were hostesses for the Citizenship Court from 1955 until recently, and we first established an annual scholarship for Junior Achievement in 1969. We have held our anniversary celebrations every five years at the Hamilton Golf and Country Club since our 40th birthday, in 1968. This continued until our 80th Anniversary, in 2008, when the Hamilton Golf and Country club was closed for renovations. That event took place at the beautiful Hamilton Art Gallery. We did return to the Hamilton Golf and Country Club for our 85th! Zonta International awards International Honorary Membership to world-renowned women who exemplify the trailblazing spirit of Zonta’s founding members. The Zonta Club of Hamilton 1 is proud to have sponsored two of the thirty-one women on this list. The Right Honourable Ellen L Fairclough joined our club in 1937 and died in November 2004, just short of her 100th birthday. She was the first woman to serve as Canada’s acting prime minister. She was a former Secretary of State and Canada’s first woman federal cabinet minister. She introduced equal pay for equal work. Roberta Bondar, a member since 1984, is Canada’s first woman astronaut. She was a crew member aboard the 1992 Space Shuttle Discovery.